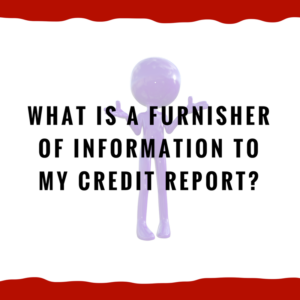 What is a furnisher of information to my credit report? You’re looking at your credit reports, and you realize that there’s some false information on there. So you do some research, and you find out about the FCRA (Fair Credit Reporting Act). While you’re looking at the FCRA, you learn about the credit bureaus and agencies, like Equifax, Experian, TransUnion, etc. They collect all this information and put it into a report. A furnisher is a person who provides, or furnishes, the information for your credit report to the credit bureaus. Let’s look at it this way: there’s a road from Capital One/Bank of America/etc, to Equifax. Every month, Captial One sends information down the road to Equifax to put on your report. It’ll usually say how much you owe, whether you were late or up to date on your loan/account/etc. This is called furnishing information. Under the FCRA, which is a Federal law, the furnisher has certain obligations, mainly that they must accurately report your credit information. Here’s a bizarre loophole. Even if they falsely report on you, the law requires you to dispute directly through the credit bureaus. If you go straight to Capital One (the furnisher), then it has no obligation (as a practical matter) to do anything. It can ignore your dispute. So if there’s false information on your report from Captial One, we have to go through Equifax to dispute it. Once we dispute with Equifax and tell them that Capital One has sent them false information, they will go to Capital One and ask them what they think. If the false information stays on your report, you may be able to sue Equifax, and you certainly will be able to sue Capital One for false credit reporting. If they have false information on your credit report, and you dispute it, these guys will have some major issues under the FCRA. I will say that, if it’s a debt collector, everything we’ve mentioned is true about disputing through the credit bureaus to dispute it. However, since these guys are debt collectors, you can also use the FDCPA (Fair Debt Collection Practices Act). If the situation is right, you can directly sue the debt collector without having to dispute it through the credit bureaus. But for original creditors like Capital One, you are focused on using the FCRA. If we can help you in any way or answer any questions you may have, feel free to get in touch with us! We’d be glad to look at your case in Alabama and help you figure out the best course of action.